Paddle through stunning country on the route of explorers, missionaries and voyageurs. Photo: Hamish Morton. The French River is one of the most important waterways in the history of Canada. A travel route of the Ojibwa Indians, the French River later became a key link in the fur trade. For this alone the French River would be remarkable. However, not only does the French River have an exceptional cultural history, it also possesses a rich natural diversity along with complex topography. Located in south-central Ontario, the 110 km corridor of the French River drains the region of the Canadian Shield between Lake Nipissing in the east and Georgian Bay in the west. The French River flows through a landscape that remains largely as it was when the first Europeans explored it over three hundred years ago. The area provides great opportunities for employing canoe and bushcraft skills. Indeed, in this environment, they fit together perfectly. 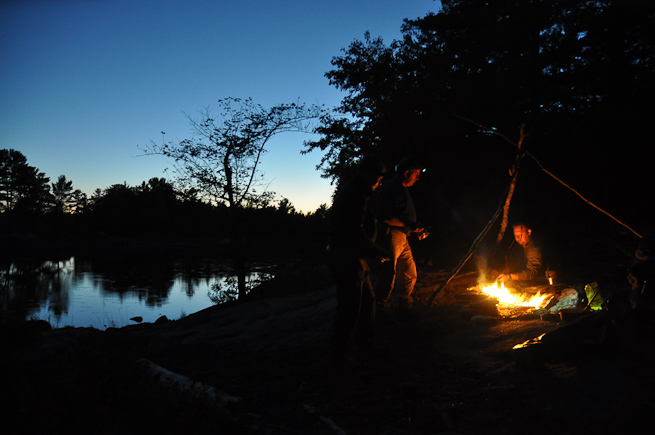 A typical riverside campfire on the French River. Photo: Paul Kirtley. The French River Voyageur is our foundation-level Canadian canoeing trip. Here, on the French River, you can hone and integrate your expedition bushcraft and canoeing skills. Indeed Ray Goodwin describes it as "the best quality training environment I've ever worked in". The French provides a great venue for canoe-camping adventures in it's own right. 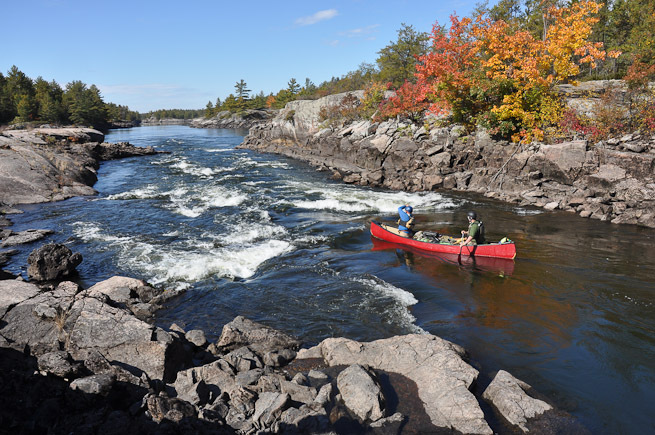 But should you wish to extend your canoe adventures even further, the French River Voyageur provides a firm basis for more demanding and remote canoe expeditions such as the Missinaibi River and Bloodvein River. The Frontier Bushcraft French River Voyageur canoe trip also explores the cultural and natural history of this great waterway. It provides a fantastic opportunity to paddle the same waters and camp in the same places as the natives, explorers and voyageurs for whom the French River provided a key link in the route between the east and the west of the country. Day 1: Arrive Toronto. Transport to Peterborough. Day 2: Canadian Canoe Museum. Transport to French River lodge. Days 3-4: Local paddling, expedition preparation and environmental training on the French River. Days 5–12: Canoe expedition, backcountry camping, rendez-vous with Dokis First Nation, paddling the Voyageur channel. Day 13: Final morning of canoe expedition. Return to French River lodge. Dinner. Day 14: Transport to Toronto.